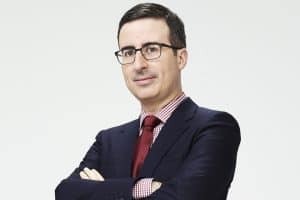 John Oliver is an Emmy and Writer’s Guild award-winning writer, comedian, and host of the HBO show, Last Week Tonight with John Oliver. On his occasional breaks from television, John returns to his first love of stand-up, performing to sold-out venues around the world. From 2006 to 2013, he was a correspondent on the multi-award winning The Daily Show with Jon Stewart, guest-hosting the show for two months during Stewart’s absence in 2013. After co-hosting the weekly satirical podcast The Bugle until 2015 and starring in his first stand-up special John Oliver: Terrifying Times, John went on to host four seasons of his own stand-up series for Comedy Central, John Oliver’s New York Stand Up Show, which featured a handpicked selection of his favorite comedians. Oliver voices the character Zazu in the 2019 Disney film The Lion King and a character in the 2019 Paramount film Wonder Park, following previous guest roles including Danger Mouse, Community, The Smurfs, The Smurfs 2, Bob’s Burgers, The Simpsons, The Detour, and Rick & Morty.